Exploring a World of Food! I’ve never had the pleasure of meeting Chef Grant Achatz, so when people ask that famous question…”Name someone that you would want to have lunch with,” Grant’s name always comes to mind. Grant Achatz is probably best known as the chef that is leading the molecular gastronomy movement here in The United States. Admittedly, I’m not a fan of the movement, but just like his Spanish counterpart Ferran Adria, I have tremendous respect for their creativity and pushing the boundaries of the restaurant world as we define it today. The book starts out talking about Grant’s humble beginnings in the business, working with his parents in the restaurants that they owned. One of his early inspirations was a book written by the late Chef Charlie Trotter. Grant was taken with the food and made it a goal to work for chef Trotter, which he did. I find it fascinating to observe how chefs who are leaders in our profession mapped out their journey to the top. One of the aspects of Grant that I admire the most are the ridiculously difficult goals that he always set for himself, and didn’t let anything get in his way of reaching them. Grant Achatz spent many of his years after graduation from The Culinary Institute of America working at The French Laundry under the tutelage of Chef Thomas Keller. I’ve read several books written by chefs that have called this kitchen home, and they all underscore chef Keller’s undying quest for perfection. The mistake that too many young people getting into the restaurant industry today make is that they think when they have a diploma, that they are already chefs that should be making a six-figure salary. The truth is that although an education is great, what it really provides is a great foundation on which to grow a career, not the pinnacle of success. I try to encourage any young person in the business to find a really talented chef to work for, put your head down and work as hard as you possibly can. To give a very edited version of the book, Grant goes on to open Alinea, one of, if not the top restaurant in America for more than the past decade. Much of the book talks about how he and his business partner Nick Kokonas bring their business plan to life. The aspect that inspired me the most during this part of the book was Grant’s attention to the smallest details, not only from a culinary perspective but also from that of design. Grant is a master of pleasing not only the sense of taste but all factions of the senses. 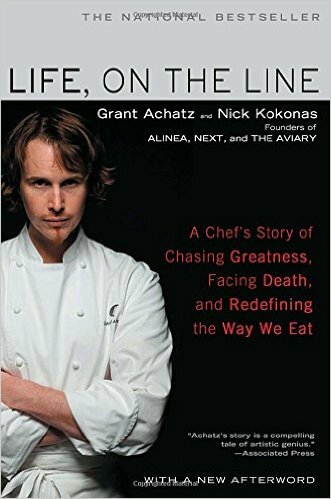 The twist to the story is that two years after opening Alinea, at the top of the world, Grant is diagnosed with stage 4 cancer of the mouth. This slice of the story would make an inspirational book in and of itself. Grant never let the illness get in his way of continuing to set lofty goals and reaching them. I have tremendous admiration for Chef Grant Achatz. His work ethic borders on being maniacal. The truth is that his work is his life. I can’t help but read this book, and wonder if he’ll have regrets when he is lying on his deathbed, wishing that he had diversified himself a bit more, in spite of all of the awards and accolades that he has garnered throughout his career. You don’t have to be a chef to appreciate this book. If you enjoy reading about people that strive to be the very best at their craft, then I highly recommend diving in and reading this.